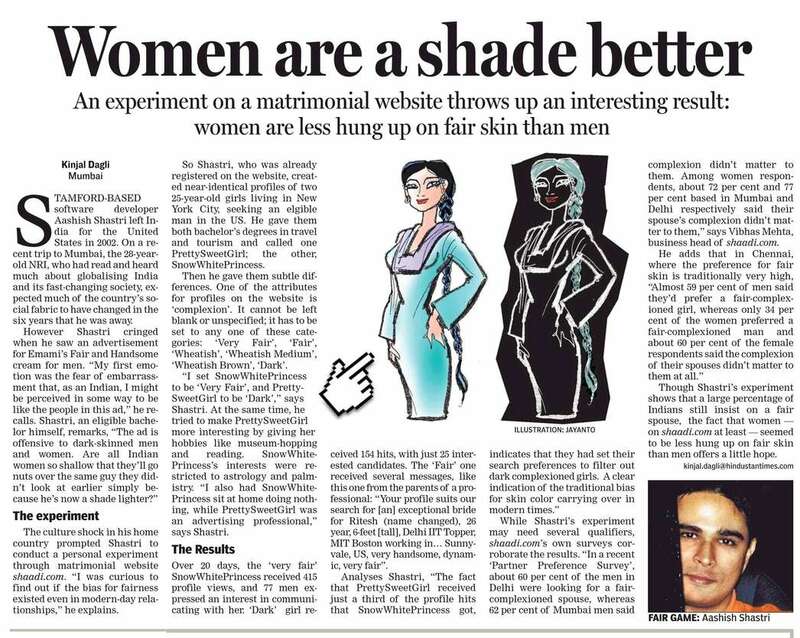 One of my previous posts “The Fairness Doctrine?” was taken by Kinjal Dagli of Hindustan times and published as part of her article “Women are a shade better”. Which means I’m in print in a national newspaper! The part related to my post is almost the exactly the way I had written it. I did notice a minor change made. I had said “SnowWhitePrincess was not a reader and also not too bright as you can tell from her hobbies – Astrology / Palmistry / Numerology, Graphology”. This was changed to “SnowWhitePrincess’s interests were restricted to Astrology and Palmistry.” Objectively, rationally, of course, astrology is nonsense, so I presume the reason was so as to not cause offense. You can click on the image to view the article in full size. Some other notes I wrote for the article. I still remember some bits of the “fair and lovely” advertisements from back when I was a kid in Bombay. Being a cricket-playing Bombay boy, such girly stuff naturally did not penetrate my mind, and I never thought about it in any detail. I remember some pictures of the girl turning fairer and with more glow spreading across the skin as an arc swept round her face. But as far as I remember, it never seemed to imply that you could not get a man if you did not use “fair and lovely”. And then thousands of “fair and lovely” advertisements later, it’s 2007, and I’m in the US. Barack Obama launches his presidential bid, and Emami launches “fair and handsome”. Because of its history of slavery, race is a very sensitive topic in the US. The history is between whites and blacks, and unlike India, there are no shades of brown in between them. The thought of such an ad in the US finally hammered in the meaning of the phrase ‘culture shock’ into me, which I had never really experienced. Funnily enough, the shock came from the Indian side. I’m pretty sure such an ad over here would cause a huge uproar and immediate disapproval. Then Obama became president-elect, and I went on vacation to India. Something stuck in my head despite all the drama of the terrorist attacks. That really set me thinking. Through the haze of my memories of the Bombay trip, I remembered something about fair and handsome. So I looked it up and found the ad that I’ve posted in my blog. My first emotion was the fear of embarrassment that, as an Indian, I might be in perceived in some way to be like the people in this ad. The ad is not only offensive to dark skinned men, but also women. Are all Indian women so shallow that they’ll go nuts over the same guy they didn’t look at earlier simply because he’s now a shade lighter? Other memories came to me. The first girl I liked in high school was dark and I remember very vividly an incident when we had a very dark skinned teacher come in. One of the students made fun of her, “Your brother is here from Africa”. I remember my surprise at being told, “But she’s not that fair”, when I told a distant relative that I thought Kajol was the prettiest Indian actress. So I knew this was prevalent in India. A few months ago I was once out with a some guys over here in the US. I pointed out an African-American girl and said that she looked cute. His response was that she was black. Ironically, the only person who could have told this guy’s skin color apart from that of the girl is probably the “Mera wala pink” lady from the Asian paints (Or is it Nerolac?) ads. So that made me curious. Would guys living in the US also have this bias? Surely men living in the vast cultural mix that is America could not be so narrow minded? Especially, since we are the minority. So it seemed an interesting and simple enough test to do and make into another blog post. Which, by the way is also a big motivation, since I enjoy writing. As far as the skin color preference goes, there are various possibilities. One is that people who show this bias may find fair skin more sexually attractive. This would be purely biological, and if so, there would be nothing wrong with that. Though, I wonder if they’ve thought through the fact that they might have to spend some time out of the bedroom too. But then again, the fact that parents also show this preference goes against this being a sole reason, if at all. Also, obviously, not all women of one color are more attractive than all women of another. And I doubt that just one feature i.e the skin color could be such a huge factor in sexual attraction. So maybe it’s social conditioning that causes this bias. In India, we notice that the poor on the streets are almost always dark skinned. Also a myriad of other oppressed people like Dalits, untouchables, and SC tend to be dark skinned. This association of dark skin with real poverty and artificial inferiority could also be a reason. There may also be some prejudices left over from the era of British rule. Being ruled over by white people might have caused an inferiority complex that might still persist despite the many thrashings of the English cricket team by the Indian. Maybe the excuse is that our team does not play fairly enough? And then, the very perception that fairer skin is attached to superior people could also make it more desirable. So if it’s such a social conditioning, it could be called a meme. A meme comprises a unit or element of cultural ideas, symbols or practices; such units or elements transmit from one mind to another through speech, gestures, rituals, or other imitable phenomena. So if people really believe in this, then fair people will tend to marry other fair people and they will propagate this idea to their next ‘fair’ generation which will also marry only fair people, and so this meme survives and continues down generations propagating itself and the fairness genes (The real things responsible for skin color) too. This is very interesting and enlightening (no pun intended) — thank you for posting this. P.S. Happy New Year to you as well! I hope you were safe over there in Bombay, especially after the tragic attacks a couple months ago. Laurie – Glad you liked the post. Nice job. I think it is a very interesting topic. I grew up in a culture that admires skin that tans easily. Tanned skin looks healthier. I have very fair freckled skin and I was always envious of my friends who got gorgeous tans in the summer. I just got more freckles. I also grew up envious of people with darker skin because they don’t age as quickly. My understanding is that the relative amount of melanin in skin is what makes it darker and keeps it protected from the damaging sun. Maybe it’s a centuries-old case of sour grapes. It is actually beneficial to health and beauty to have dark skin, therefore people with lighter skin tried to make it seem less desirable? Good to see you drop by. Thanks for your thoughts. I guess it varies from culture to culture and even place to place. But in this case in India, even the darker people seem to have this bias. So I think it’s a bit different from what you experienced in your culture. But that is certainly something I hadn’t known before. Actually, over the years, I’ve seen a number of adverts for skin whitening cremes for sale in the US and also in Southeast Asia (Vietnam, China). You see odd products like that in the US if you visit a beauty supply shop in the innercity. It really is perverse but some people buy into the commercial ideal of beauty that is celebrated in the media…basically of super thin, light skinned, Barbie freaks. 😛 That’s why Toni Morrison wrote The Bluest Eye. Here is the url for one skin whitening creme that has customers in the US. http://www.godivaskincare.com/store/home.php This one at least has tried to be somewhat ‘politically correct’ by says that their creme is for clearing up your skin or minimizing scars, etc., but that’s not what a lot of people purchasing the stuff are looking for it to do. Oh and congratulations on the article…very cool. Thanks! I don’t think I have been in a beauty shop ever, so that’s pretty interesting. I also saw this on the website. For brown and dark-skinned individuals who want even overall skin tone. They just stop short of saying it! Oh, I want to see your picture now after reading Laurie’s comment. I already swoon over your writing! What an interesting, well-written post. Congratulations on getting published in the other article. When I lived in Japan, there were a lot of skin whiteners for sale. And one would be tempted to think it has to do with the marketing that has been done over there since WWII, etc., but the popularity of the white-faced geisha precedes that. I have read that there is a biological component (sorry if I’m covering ground which was covered in the article as I’ve only read your post, so far.. ) for many men being attracted to women a few shades lighter than themselves, which might account for why women from the lightest groups are not absolutely considered more beautiful than women in other groups of skin tone. Well, take care! Keep up the good work! About that product, 2, I’ve actually heard from a black friend that there is a common skin condition resulting in uneven skin tone problem for some black people, which may give some legitimacy to the product. There’s a name for the skin condition. I forget what it is. That’s what Michael Jackson claimed to have as well. There is a dramatic difference in the person’s melanin so they have very light splotches all over their dark skin and can feel self-conscious. Thanks for your comments! As always, you have something interesting to say. The uneven skin tone thing was something I was not aware of and I think that does make me look at this in a different perspective i.e I realize that not all cases are black and white when it comes to using these kinds of creams. And also thanks for your comment on my picture. I’m going to be on a high for all of this week! Oh, and sorry I took so long to respond, but I recently moved, and didn’t have Internet access for a couple of weeks. regards memes – I remember reading an article somewhere in reader’s Digest that an experiment indicates that within another century or so most of us would be various shades of brown due to cross breeding between people of different cultures. But that one was specifically for US.